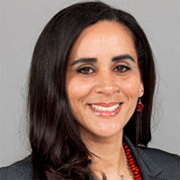 Agatha Caraballo is the Assistant Chair of the Department of Public Policy and Administration, BPA Director, and Digital Instructor at Florida International University (FIU). Her dissertation toward a PhD in Public Affairs explores the “Impact of the Round II Urban Empowerment Zones on Local Communities” and examines the federal program’s effect on local business and employment growth. Currently, Agatha teaches the undergraduate course “Applied Statistics for Non-Profit and Public Service” at FIU Online and is a graduate intern at FIU’s Metropolitan Center, an applied social science research and training institute that provides economic development, planning, performance improvement, and policy solutions to public, private, and non-profit organizations in South Florida. In addition, Agatha is on the Board of Directors for the South Florida Chapter of the American Society for Public Administration (ASPA), and serves as the President of the Pi Alpha Alpha Honor Society at FIU, an initiative of the National Association of Schools of Public Affairs and Administration (NASPAA). Agatha has more than ten years of experience in higher education and non-profit organizations. At Miami International University of Art & Design, she was first a Financial Aid Officer, and then a Career Services Advisor, and served on various educational committees. While working for Alonzo Mourning Charities, Agatha recruited corporate sponsors and coordinated events for the Zo’s Summer Grove annual fundraising activities in Miami. As the former executive assistant for the Martin Z. Margulies Foundation, she managed an extensive fine art collection and acted as the developer’s liaison during the construction of the Overtown Youth Center. She lives in Miami with her husband and daughter.